They've got the flesh-gouging teeth and the powerful jaw muscles, but a new study suggests young great white sharks 8-10 feet long still have some growing to do before they're able to bite with the same legendary force of their larger elders. New computer simulations show that the younger sharks just aren't able to handle such an intense bite. "[Their jaws] just couldn't handle the stress associated with big bites on big prey," said Stephen Wroe, a research biologist at the University of New South Wales near Sydney, Australia. That stress can be substantial. A full grown great white shark can produce close to 4,000 pounds of force as it bites, which is about 20 times more powerful than what a human jaw can produce. It's understandably difficult to take an in-depth look at a shark bite in the wild, so Wroe and his colleagues turned to a type of computer simulation often used by engineers that measures how much stress an object experiences as it works. Technicians use this "digital crash-testing" to test the performance of everything from car engines to space shuttle tiles. The researchers discovered that a shark bite might be one of nature's most impressive crashes. For instance, the wider a shark opens its jaw, the more forceful its bite -- aided by the unique placement of muscles that powerfully slam shut the jaw at full gape. That's a big difference from a mammal's jaw, in which the bite force weakens as the jaw opens wider, said Toni Ferrara, who was the lead author of a the Wroe study published Dec. 2 in the Journal of Biomechanics. A great white shark who dines on larger prey like a seal lion needs a strong jaw when they open wide to take a bite. But the researchers found that this power only comes with age. The jaws of adult sharks are reinforced with a mosaic of calcium crystals that add stiffness and strength. 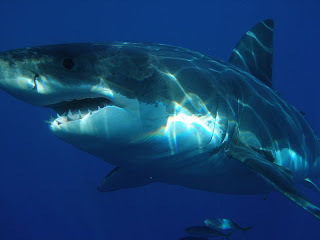 Because younger sharks that are still developing this protective layer, said Wroe, the stresses on their jaws might not be ready to handle a full-force bite on when attacking prey. The findings could also help to explain why great white sharks around 10 feet in length are not as consistent at successfully completing an attack on a seal or sea lion as their larger elders. But the younger sharks would actually like to eat these bigger animals if they could. "They have a harder time chewing them," said biology professor Frank J. Schwartz, who studies shark behavior at the University of North Carolina's Institute of Marine Sciences in Morehead City, N.C. "They aren't as efficient as adults at tearing through the blubber." This unexpected weakness of juvenile sharks is "likely to challenge public perceptions of these animals," said Ferrara. "They certainly aren't the omnipotent killing machines that some people see them as." Better sunscreen for windows...from beetles?